Whilst the mainline railway artery to the West Country was destroyed at Dawlish in a massive storm this week, there has been some good local rail news as the steam-operated South Devon Railway (SDR) managed to reinstate its own tracks yesterday afternoon (Thursday 6th February) six weeks after a serious 500-ton landslip completely blocked the railway at Christmas. The landslip led directly to the loss of seven days of seasonal ‘Mince Pie’ trains from Boxing Day into the New Year, and SDR staff, volunteers and Staverton-based contractors Kevin Thulborn, have been battling against the clock since then to clean up the mess and repair the damage, but the line is now ready to re-open just in time for its Winter steam Gala during school half–term week from Saturday 15th to Sunday 23rd February. 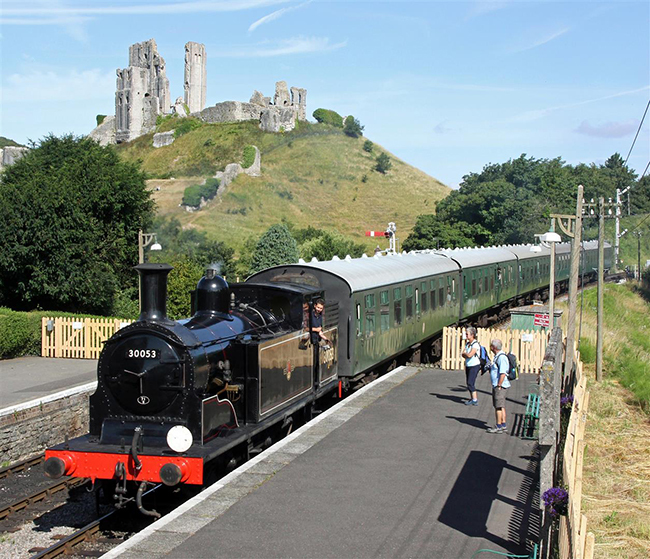 The SDR hopes that the Gala’s ‘Devon Branch Lines’ theme will appeal to locals, holiday visitors and enthusiasts alike, some of whom missed out travelling on the steam trains after the Christmas washout, so it should be the ideal start to the season and a much needed boost for the railway’s finances after the recent enforced closure and expensive repair works. Over both weekends (15/16 and 22/23 February), plus Friday 21st February, the gala will feature a very special, first-time visitor to the SDR in the form of a venerable 109-year-old steam loco, M7 Class No. 30053, built in 1905 by locomotive engineer Dugald Drummond for the London & South Western Railway (LSWR). The 0-4-4 wheel arrangement and elderly looking M7s were an engine type that once graced many former LSWR branch lines all over Devon — but which never ran on the SDR’s Great Western route — and star guest No. 30053 will bring back fond memories of the West Country railway scene of 50 years ago. The engine is visiting the SDR courtesy of the Swanage Railway and Drummond Locomotives Ltd, and arrives by low loader on Wednesday 12 February. During the heyday of the LSWR, and then the successor Southern Railway, but before the infamous ‘Beeching Cuts’ and the end of steam trains on British Railways in the 1960s, M7 locos could be seen right across Devon. From Ilfracombe and Barnstaple in the North; Okehampton, Tavistock and Plymouth in the West; and Exmouth, Budleigh Salterton, Sidmouth, Seaton and Lyme Regis in the East, the M7s were once a regular sight. As the last M7 working in Devon 51 years ago during 1963 was based at Exmouth Junction loco shed in Exeter — serving the lines in East Devon to Exmouth, Budleigh Salterton, Tipton St. John, Ottery St. Mary, Sidmouth and Seaton — the SDR is hoping that people in East Devon will make the local connection and come to the Winter gala to see an M7 run in Devon again. Now, only the Exmouth branch railway line survives in East Devon, but part of the former Seaton branch has become the popular, electric-operated Seaton Tramway. The other steam stars of the SDR’s Winter ‘Devon branch lines’ Gala are: the sole survivor of the GWR’s ‘2251’ Class No. 3205, which is making its first public appearance in British Railways lined green, and ex-GWR 57xx pannier tank No. 5786, still appears as L.92 in the London Transport livery it was painted for the 150th anniversary of the Metropolitan Railway last year. All of the steam locos will head a variety of typical, two, three or four coach branch line passenger trains formed of either Great Western or British Railways ‘blood and custard’ and ‘chocolate and cream’ liveried stock, plus some demonstration milk, parcels and unfitted goods trains, along with help from some typical 1960s era branch line diesels, including Railcar W55000, Class 04 No. D2246, and Class 09 No. D3721. There will be an intensive timetable and enhanced services on both weekends with early passenger trains from Buckfastleigh at 09.00 and Totnes at 09.37, plus late trains on the Saturdays including hot food on the 18.10 Buckfastleigh departures. On both Sundays, visitors and enthusiasts can enjoy early morning sausage and bacon rolls on the 09.40 and 11.10 round trips from Buckfastleigh, and there will be a real ale and cider bar on the main four coach trains. The on–train bar is being operated by the Devon Diesel Society (DDS) as usual but, instead of the profits going to their own projects, the DDS will donate the bar income to the SDR to help pay for the landslip repair costs. The DDS have also gained helpful sponsorship for the on-train bar from Tavy Ales who will be supplying the two cask and bottled real ales over both weekends, plus Teign Cellars, a craft beer pub in Newton Abbot, who have sponsored the cider. As the SDR has incurred large, additional hire and haulage costs to bring the M7 back to Devon, special Rover fares will apply on both weekends, but normal fares will apply to the mid-week three-train service from Monday to Thursday, plus the enhanced Friday timetable when the M7 will work four round trips. Full details can be found here. Getting the tracks ready for the Gala after the landslip has been no easy task for the SDR with an estimated 500 tons of rock, soil, mud and trees blocking the line near milepost 4½ between Buckfastleigh and Staverton. It resulted in the SDR having to cancel most other planned Winter works and then undertake a lot of unscheduled clearance and repairs, made all the harder by the awful wet weather and resultant difficult ground conditions. The first engineer’s works train to run from Staverton to Buckfastleigh for over a month finally made it through very cautiously on Thursday 30th January after the worst of the trees, debris and mud had been removed and, with some remedial work still to be done, the line was passed as being fit for passenger traffic yesterday at 15.00 on Thursday 6th February. “The very wet weather over Christmas led to a serious landslip which blocked our line between Buckfastleigh and Staverton. If the railway’s base formation had been washed away — as happened so drastically at Dawlish this week — and it could not have been easily repaired at reasonable cost using our own staff and equipment, then we might well have had to consider closing the railway for much, much longer. It was a very serious situation to face! Thankfully, the damage was not as bad as we first feared, but it was in a very inaccessible place which made the clear up and repairs difficult, and it took some time to clear the fallen trees, debris and then re-instate the track and new drainage. Our staff, volunteers and contractors have all worked magnificently to effect the repairs in time — and against the clock in some truly awful weather and ground conditions — so that we could reopen for business in February. One really great and satisfying thing is that the work has largely been done using our own Permanent Way staff, expertise and specialist equipment — in which the SDR has invested strongly in recent years — and having that resource speeded up the repair and reinstatement works considerably. With a week to go to the Gala, it’s been a close run thing but the SDR is open again!